Been very busy with the parts kits, but had some time today to add some pictures kindly provided by a couple Zero Percent customers. I also added several P229 and P226 pictures to the Customer Build Gallery page. 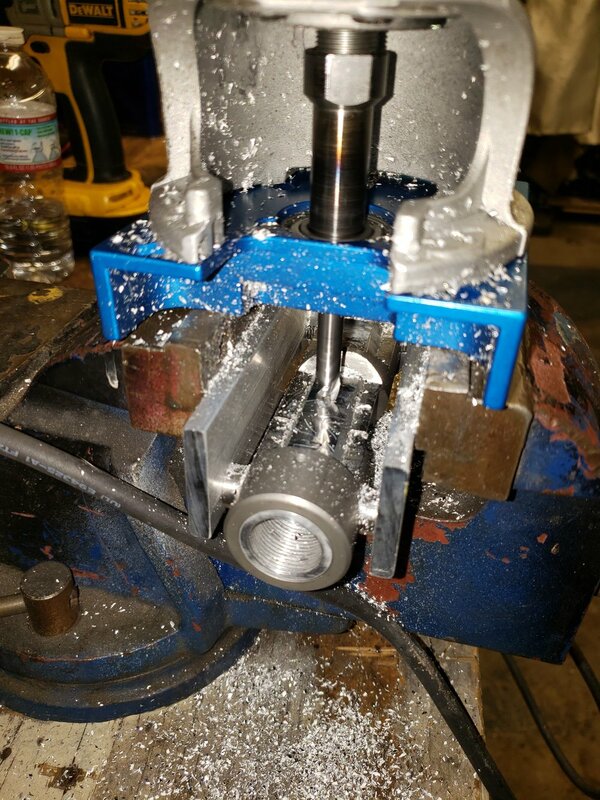 The third image below is from a customer who wanted to see if his mini-mill with a “crappy” XY table could make the cuts in the tube inside the jig more speedily. It came out kind of rough in places, but perfectly usable since those bottom surfaces are covered up by the grip frame. 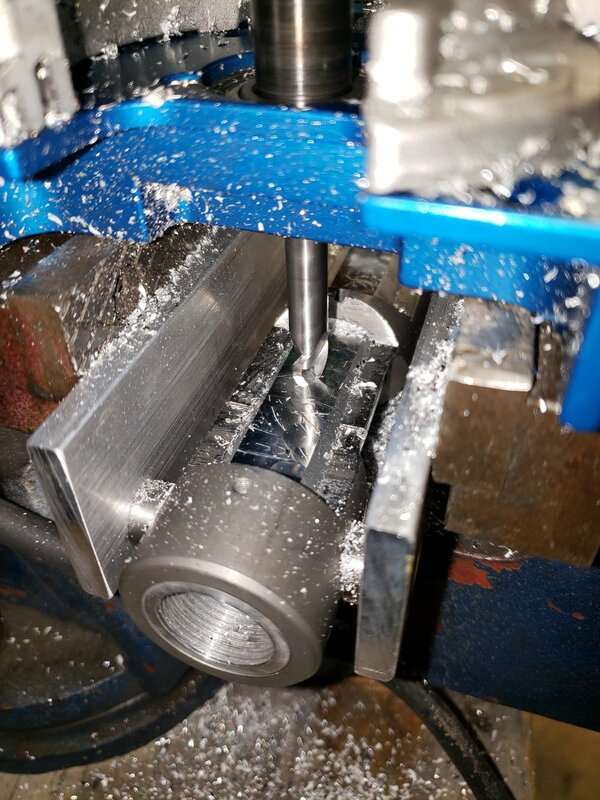 I don’t recommend it, mainly because it is possible to damage the jig, even though the jig is very hard, I am guessing that the high speed steel rotating cutter could cut into the jig, ruining both the cutter and the jig. The parts kits are moving along, I still have the hardest parts to do, the grip frame, bolt, and the barrel. I still haven’t decided how to make the disconnector, EDM and mill it from solid, or stamp it out. I haven’t made a part like that before. Will post some video or pictures on the process for making the barrel, grip frame, and bolt. Making the Sig frames really helped to school me on making frames. Speaking of Sig frames, I can’t say enough good things about their products, they’re such well designed and manufactured firearms, and the company is pretty cool also. They knew I was making the Sig 80%, but never gave me a hard time, in fact one of their factory reps was recommending my frames to gun shops who carry 80% products. Sig Sauer contacted me recently asking if they could buy some of my new P229 frames with the 226 magwell ,in steel. I am not making any more Sig frames, especially in steel, so I couldn’t help them out. Who knows, maybe someday we will see a factory P229 with a 226 magwell. I realize that the lack of Zero Percent parts kits are putting a big damper on people getting started on their builds, but if anyone has some pictures they want to share, I would like to add them here on the Blog. For the next couple months, anyone that sends in some pics I will send a free aluminum tube. “Hello, I figured I’d send some pics of my first attempt with the jig. I’m pretty happy with the results and I think it’ll work. I might have to do a little more filing on bottom cuts but it’s very close to the templates. I’m gonna order a couple more tubes once the parts kits are done. You did a great job on the jig. Thanks. I used the brownells file I have that I used on a 1911 slide that didn’t have the sights cut on the slide. It works really good for dovetail cuts. It’s amazing what can be done with some good files and thanks to the hardened steel on the jig I’m sure I can do a bunch more receivers without effecting the dimensions of the jig. The barrel threading came out great because of your jig. “Attached are some photos. Sure appreciate you excellent work and products. so I can Cerakote right after. save time, but didn't have to work so hard. I find another barrel. (or you get your barrels ready). It's not a real dovetail, just clearance groove for the rail/sight. Below is a great group of pictures from a customer. I was really happy to see people getting some parts on their tubes. I wanted to share some pictures and my experience with you regarding your zero percent jig. Overall the jig is amazing and worked perfectly. I have finally completed a mkii with parts I scrounged off of Ebay for the last couple months. The only thing I'm missing is a rear sight or a rail with a red dot. Starting out with the tube i got from my metal supply shop it was a bit oversized on the outside as well as the inside. I have a friend with a lathe so we spent one afternoon turning down the o.d. as well as reaming the i.d. to size on a bunch of tubes. After that I went home and started the process or completing one. 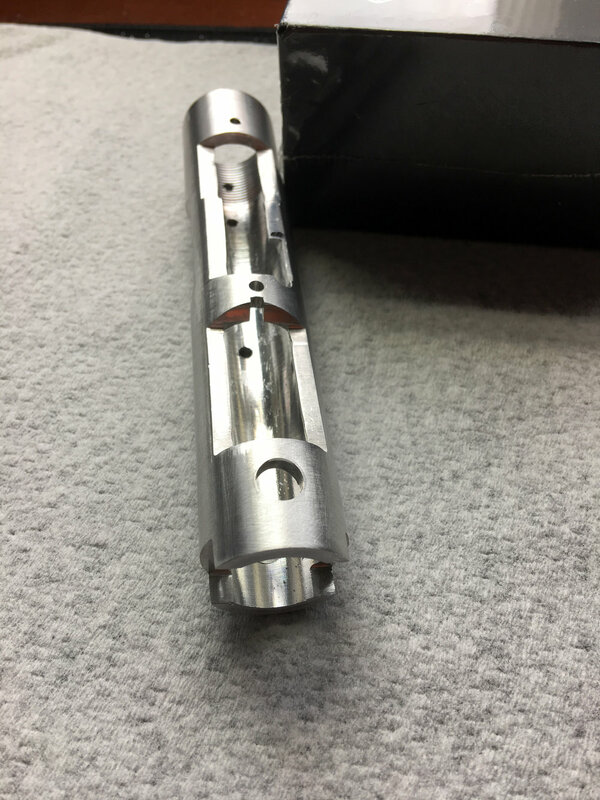 The threads for the barrel were the easiest and least time consuming part. The removal of material for the other locations proved to be a headache with the hack saw I had. I stepped it up a notch with a sawzall and that made short work of removing the aluminum. But boy did it make some noise and rattle the heck out of the work bench. After that the filing was next and that was tedious as well. After threading on my barrel I noticed that the front sight wasn't in the right spot in respects to the rear takedown hole. It was about 90 degrees off. So I just drilled another takedown hole with the idea that this tube was going to be a test run. Well that was short lived and I couldn't stand the way it was going to look so I started over. So this time I threaded first then drilled the takedown hole and it looked a lot better. I then had the idea of removing the rest of the material with the router I use for making ARs. It worked a lot better that I thought it would and it took about 10 min to hog everything out vs the hour or so it took with the hack saw and sawzall. So once i got all the material removed and filed to spec I threw it all together and did a functions check. 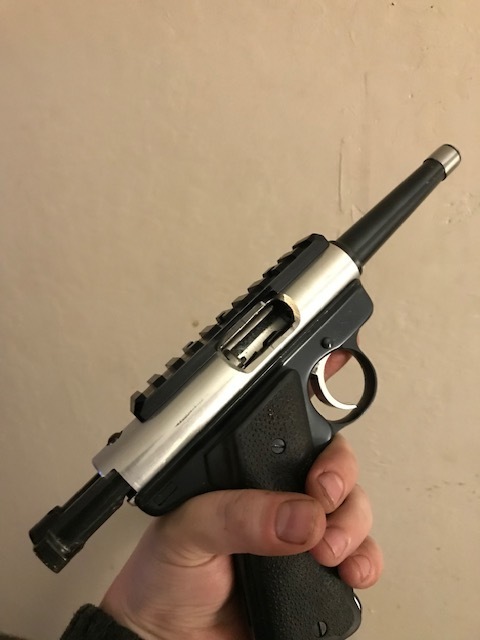 Everything seemed to work the way it should, at least it appeared to due to this being the first time handling a ruger mk series. So I went to the hills with a full magazine and without any hesitation I went full tilt, cocked it and pulled the trigger 10 times. The result was flawless. No issues at all, and I had the biggest smile on my face. So now that I knew it worked perfect I took it home and stripped it down to do some final smoothing and finishing touches to make it look good. One issue I forgot to mention was the barrel worked loose as I was function testing it after I assembled it. To fix that I used the bottom hole as a set screw to hold the barrel still as well as the second hole from the front on top. 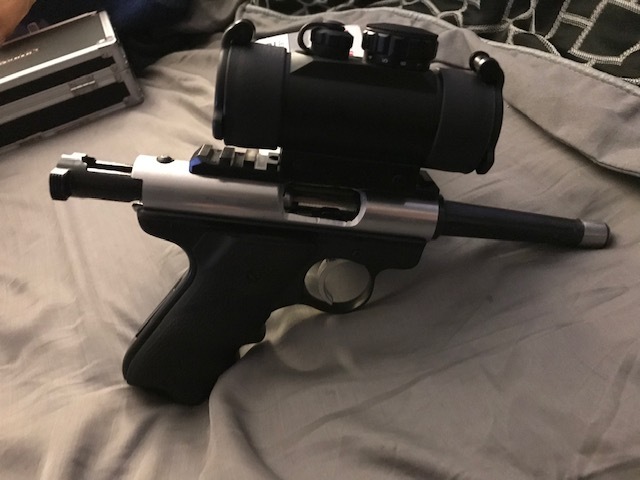 Once I get to final assembly I'll loctite the barrel itself as well as the set screws and let it sit for a day or so before shooting it at all. Sorry for the dirty work bench and crappy photos, I was just excited to get it done and shooting. Thanks again for an awesome jig and I look forward to your parts kits being released. I hope that project is going good as well. Until next time.